Horny Hollow Trail closed Feb 1 to August 31. 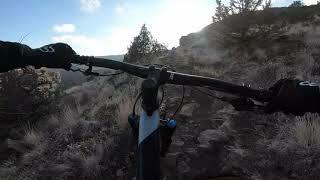 This is a beautiful ride that starts out by Crooked River Ranch and has segments that run along the Crooked River. There's about 700ft of climbing or so over the 7 mile loop. The end has views of lake Billy Chinook and there is a section that has some pretty good cliffside exposure looking down into the Crooked River! Nothing unmanageable if you keep your eyes on the trail. The back loop is pretty sandy, so this may be better for winter riding. Horny Hollow Trail is closed from Feb 1 to August 31. There is some cliffside exposure. The black difficulty rating is largely due to the very rocky descent/climb and some cliffside exposure. Most of the rest of the trail is more like green/blue. When you start, stay to the left and take the singletrack from the trailhead. When you finally get to a junction take a left—that keeps you on Otter Bench Trail. Do not go straight—you'll see a sign that indicates no bikes if you go that way. That is Pink Trail that descends into the canyon and is for foot traffic only. To the right is Horny Hollow Trail, which will take you back toward where you started, but it's closed from Feb 1 to August 31. Once you continue on Otter Bench Trail, you'll start a rocky climb that opens up to views of the canyon where the exposure starts. It's really beautiful, but keep your eyes on the trail or stop and smile. Eventually, you'll reach a really rocky downhill and then a small left/right junction that will form a loop. Proceed left around the loop. You'll reach views of Lake Billy Chinook once you get to the end. Then you'll get to climb back up that super rocky descent and back to the junction where you can take Otter Bench back or Horny Hollow Trail if it's open. I wouldn't suggest Horny Hollow Trail. As far as I could tell it was just a wide, flat doubletrack (unless I somehow missed a singletrack out there?). It's more like an expressway back. I think Otter Bench Trail would be a more fun return.